Squares quickly increased in popularity as pleasant, airy places to live and houses sold quickly. Many squares, set among fields, had views of the open countryside. Cavendish Square, begun around 1717, was built in line with Hanover Square, establishing the pattern of streets north of Oxford Street and making Marylebone into a new and fashionable part of London. To the east, Hoxton and Charles Squares were built in Shoreditch. But by 1725 many squares had become choked with rubbish and the focus of crime and anti-social behaviour. Most were poorly maintained and open to abuse by both the public and the square's own residents. 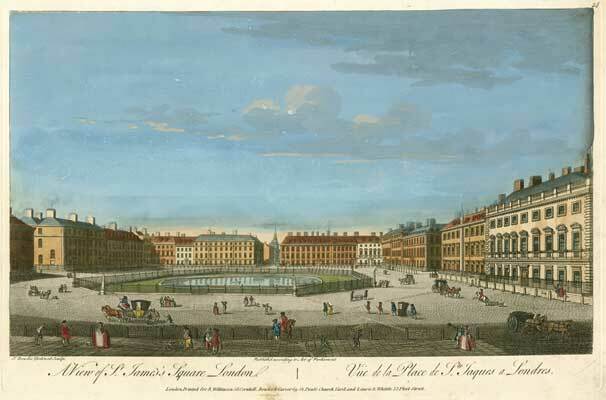 The St James's Square Act of 1726 created a board of trustees with the power to make a regular charge on residents for the maintenance of the square. This was a turning point, and many other squares followed suit with their own Acts. Greater control allowed squares residents to increase security, which helped improve the condition of squares and their gardens, but led to more squares being fenced off from the public. 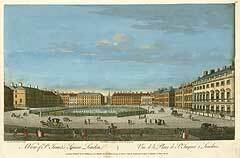 Soho Square was given iron railings and a new layout in 1748, followed by Golden Square. By the mid-century many of London's garden squares had enclosed gardens, open only to resident key-holders. The new garden layouts were grander, but remained simple. Garden writer Thomas Fairchild urged squares to adopt 'the Rural Manner' with groves of trees, fountains and shady walks. Grosvenor Square was laid out as a 'wilderness', a kind of formal woodland, in 1725 (see photo, top right), but for the most part gardens remained open to view, for both practical and security reasons. 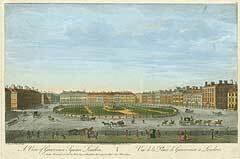 The St James's Square development was begun in the 1660s by the 1st Earl of St Albans in the fields north of St James's Palace. It was a fashionable area, close to the royal court and the heart of government. There was a church to the north and a market place to the east. Filthy conditions in the square led residents in the 18th century to petition Parliament for more control, and the resulting legislation gave residents the ability to 'clean, repair, adorn and beautify' the square. 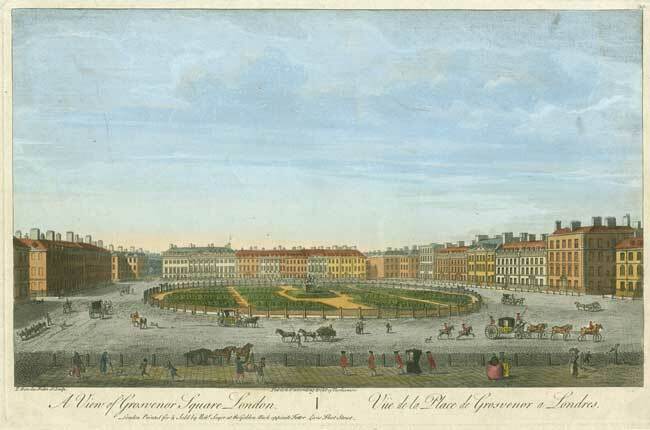 Watchmen were appointed and Charles Bridgeman designed a grand new garden (left) with a large basin of water at the centre, surrounded by eight stone obelisks bearing lamps. Iron railings replaced the old wooden fences in 1728. In 1817, eminent architect John Nash remodelled the gardens with winding walks and extensive shrub planting. After WW2, the square remained open to the public. Following two 20th century restorations, the square today remains one of London's finest, still surrounded by magnificent houses. The brick folly in Gibson Square and an elegant pavilion in Park Crescent disguise vents for the London Underground. I think some sort of Wilderness-Work [in squares] will do much better, and divert the Gentry better than looking out of their Windows upon an open Figure.